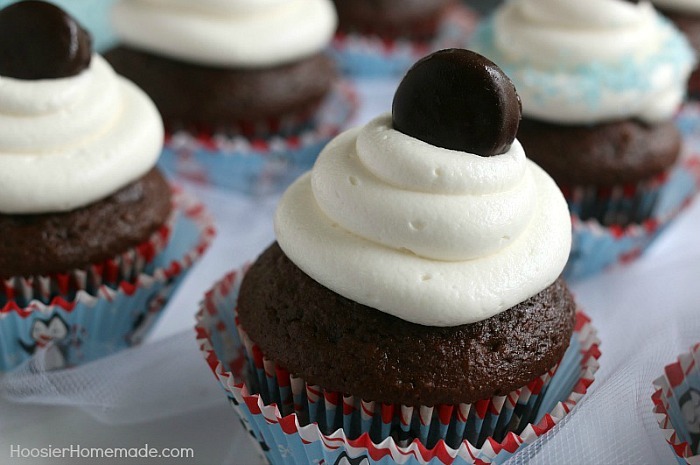 These Chocolate Peppermint Pattie Cupcakes are bursting with flavor! A simple chocolate cake mix is turned into a luscious holiday treat. 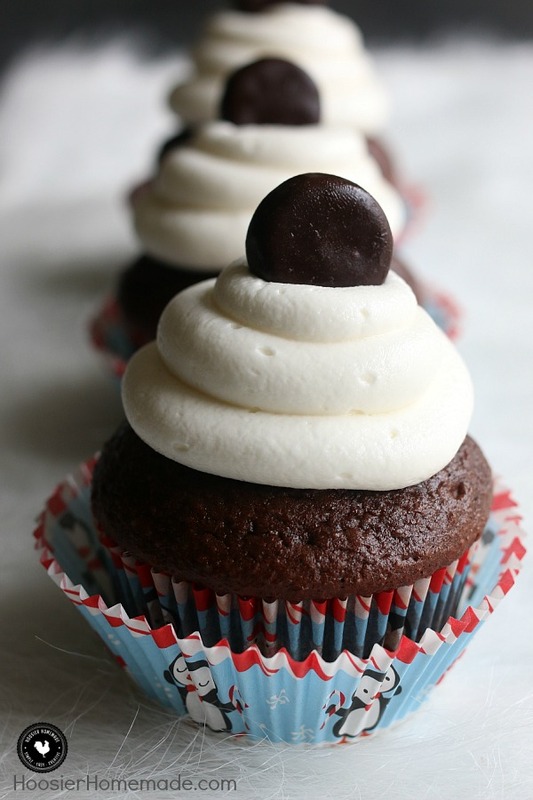 And then if that’s not enough, topped with Buttercream Peppermint Frosting and a mini Peppermint Pattie. 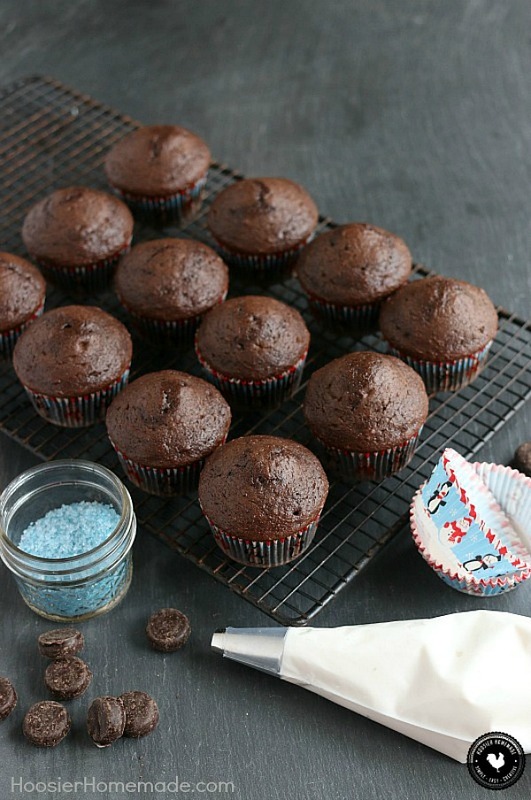 Nothing beats a chocolate cupcake…except maybe one with peppermint. I love the cool creamy flavors of chocolate and peppermint together. Somehow it just screams the holidays to me. 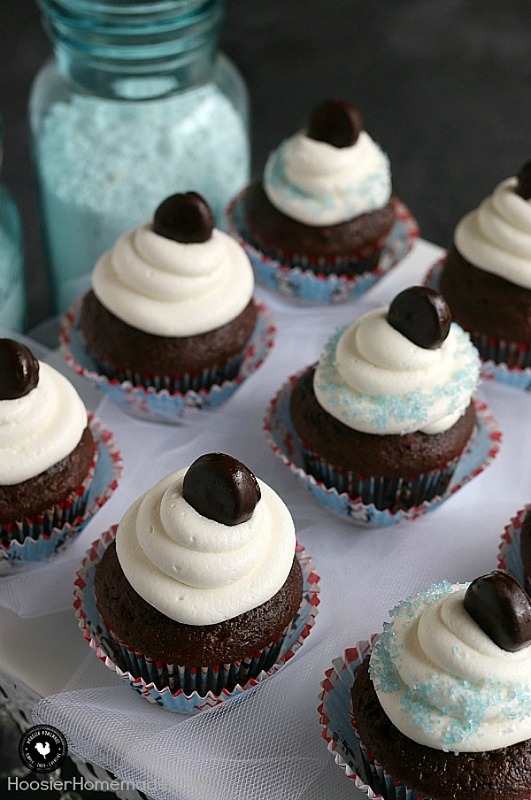 These Chocolate Peppermint Cupcakes are perfect for any occasion really. But would make your Christmas Dessert Table shine! They are super easy to make too. The cupcakes start with a simple chocolate cake mix, I used Devil’s Food. Then I like to add ingredients to make the mix taste homemade – 4 eggs instead of 3 and instead of milk, I used International Delight York Peppermint Pattie Coffee Creamer. After they are baked and cooled, I added Buttercream Peppermint Frosting, similar to my favorite Buttercream Frosting but instead of all butter, I substituted half with shortening to get the bright white color, and I added peppermint extract instead of vanilla. Often times vanilla can color frosting, unless you use white vanilla extract. 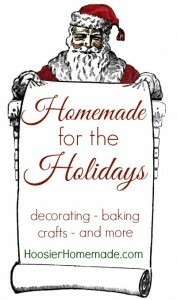 The frosting is then piped on with a large round decorator tip, I used #2A. 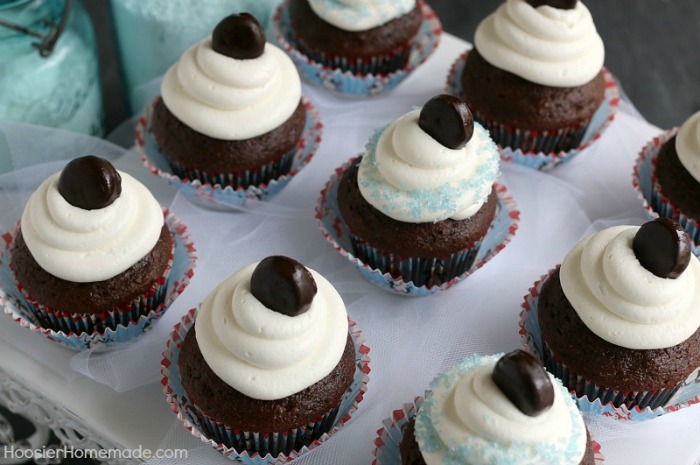 Then blue sprinkles and topped with a mini York Peppermint Pattie candy. What brand of cake mix did you use. Most cake mixes I’ve used don’t require milk. How would you integrate the creamer if it doesn’t ? Any cake mix is fine. I always use buttermilk in place of the water on the package. So to substitute any flavor creamer, just substitute for the water. Substituting the milk for flavored creamer is GENIUS! These look awesome!